Doremisoft Kodak Video Converter is the best Kodak video software to convert Kodak video to MP4, WMV, 3GP, iPod, iPhone, Gphone etc. Doremisoft Kodak Video Converter can also convert Kodak video MOV for playback on various players such as iPod, Phone, iPhone 4, PSP, Apple TV, BlackBerry, Zune, Gphone, Palm, iRiver and various other players. Kodak Video Converter - The best Kodak video software to convert Kodak video. ...... iPhone 4, PSP, Apple TV, BlackBerry, Zune, Gphone, Palm, iRiver and various other players. 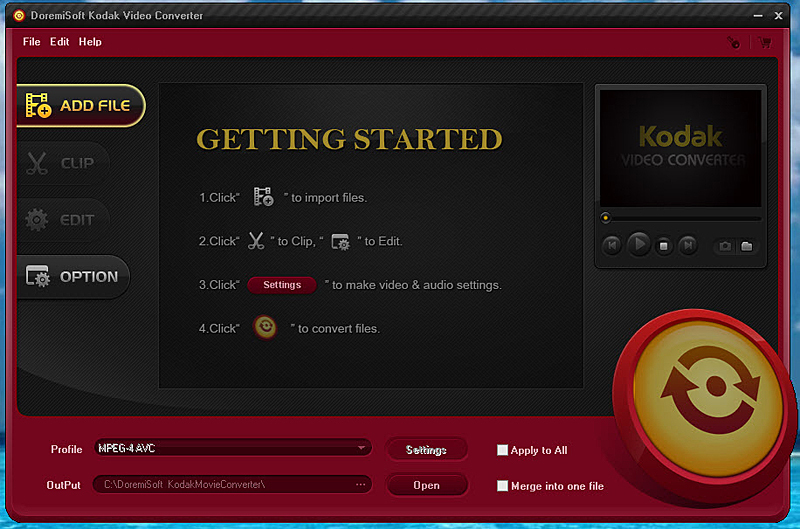 Doremisoft Kodak Video Converter is also a great Kodak video editor. It lets you to easily edit Kodak videos by cropping video, multi-trimming file length, adjusting video brightness, contrast and saturation, and merging Kodak videos into one file and so on. With Doremisoft Kodak Video Converter, you can easily get the best out of your Kodak video cameras, including Kodak Zi8 and Kodak Playsport and so on, and share your favorite Kodak videos in all sorts of video formats, mobile player and on the web. * Convert Kodak MOV to MP4, avi, 3gp/3g2, mpeg1, mpeg2, mpeg4, flv, swf, mkv, dv, rm/rmvb, wmv, m4v and so on. And extract audio from Kodak MOV to wma, m4a, mp3, wav, aac, ac3, amr, mp2, flac, aiff, mka etc. Qweas is providing links to Doremisoft Kodak Video Converter 4.0.2 as a courtesy, and makes no representations regarding Doremisoft Kodak Video Converter or any other applications or any information related thereto. Any questions, complaints or claims regarding this application Doremisoft Kodak Video Converter 4.0.2 must be directed to the appropriate software vendor. You may click the publisher link of Doremisoft Kodak Video Converter on the top of this page to get more details about the vendor.